WeyTy X6S is an excellent action camera that gives 4K resolution and works 30m deep in underwater. This camera offers various features that work great for every adventures people who wanted to capture their moment. This Action Camera WeyTy X6S Review gives you the complete idea about this camera. Recording Time(64GB): 240min([email protected], [email protected], [email protected]), 480min([email protected]), 640min([email protected]). Just like every other action go pro camera WeyTy X6S was also tiny and compact but the built-in quality and design separate this from other action cameras on the same price and matches to the one which is pricey and works at advance more like a professional camera. The body of the camera is compact and solid. The camera is light weighted the weight is about 1.1 pound which makes it easy to balance on the drone and other fast-moving vehicles. The design is quite same to every other action camera, but it has a strong body that saves camera from unexpected fall or vibration. The sensor has an upgraded CMOS that makes the camera special to give vibrant visual and images. Other than just the camera the offered kit and accessories were also solid and stable especially the waterproof case. The waterproof case is strong and tight that holds the camera without any external damage or pressure in underwater. Action Camera WeyTy X6S has the bigger lens for a wide angle coverage. It comes with a metal wire with small loops at both ends for the use of tethering. The overall design and built quality are solid enough to make the work done without any barriers. Check this Campark ACT74 review too. WeyTy X6S gives ultra HD real 4K video quality, what does that mean? This camera has the new generation upgraded CPU gives a super high-quality resolution. This new generation upgraded CMOS that gives a clearer and brighter image. It has 16MP alone with a wide angle lens that covers up to 170 degrees wide that captures everything around. These new updates ensure every user to capture high-quality pictures and videos easily. The images and videos are brighter and natural compared to the other action cameras thanks to the new upgraded CPU, this also captures brighter quality images even on the night on the minimum light. This action camera also has inbuilt WIFI to connect with your personal computers and laptop, other than this the company also has an individual app on both play store and apple store to take full control of the camera in hands. The app helps to operate drone easily from your mobile and the inbuilt WIFI displays the view on your mobile phone, so you can easily handle it. The WIFI range is decent and works fine without losing connection. 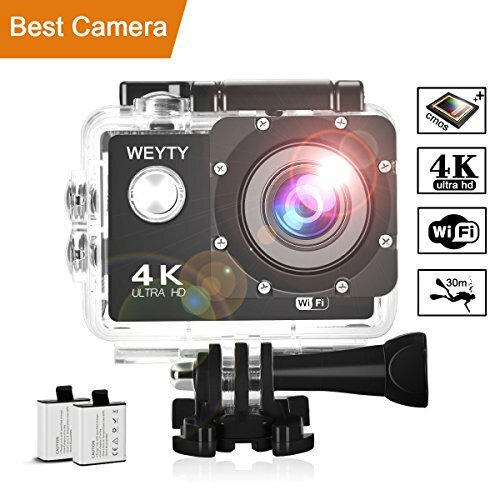 This action camera also performs great in underwater, it has the solid waterproof case that closes the camera tightly inside the airtight case without allowing any water inside it, and the company offers a metallic wire with small loops to attach on the case to avoid floating while capturing under water. Now speaking about the battery life the company offers two 1350mAh batteries. The charging time of this battery takes only 2 hours and the performance time of each battery is based on the capture quality you chose. The battery records about 115 minutes in (1080P), 240 min (4K @30fps, 2,[email protected], [email protected]), 480min ([email protected]), 640min ([email protected]). This camera also offers slow motion recording of [email protected] and [email protected] This allows the users their live moments in a cinematic way. The photo pixel of the camera is 16MP/12MP/8MP/5MP/2MP. The exposure of the camera is from -2 up to +2 and with various white balances like Auto/ sunny/ cloudy/ incandescent light/ fluorescent light. The company offers multiple kits and accessories like waterproof case, clip, protective door cycling stand, helmet base, 3M adhesive tape, back clamp, fixed base, transfer bracket(3), USB cable adapter, safety rope, bandage, cable ties and lens cloth. All these accessories can also be used to another camera like Akaso, carpark, Crosstour, fitfirt, Yi and even cameras. The memory supports up to 64GB. The overall performance of this Action Camera is stunning. This new launched WeyTy X6S had been bought by more than fifty customers, and everyone rated it five out of five on the online rating. This new advanced camera has no negative comments so far than few drawbacks. Many customers had quoted it handy and very simple to handle. They were astonished by the video quality. The drawback of this action camera is it don’t have anti-shaking and image stabilization. If you have any other queries on Action Camera WeyTy X6S Review, you can write it in the comments section.